Using an ultrafast, ultraprecise laser, a team of physicists and biologists at Vanderbilt University has taken an important step toward understanding the nature of these trigger signals. Their new insights are described in a paper titled “Multiple mechanisms drive calcium signal dynamics around laser induced epithelial wounds” published Oct. 3 by the Biophysical Journal. Previous research had determined that calcium ions play a key role in wound response. That is not surprising, because calcium signaling has an impact on nearly every aspect of cellular life. 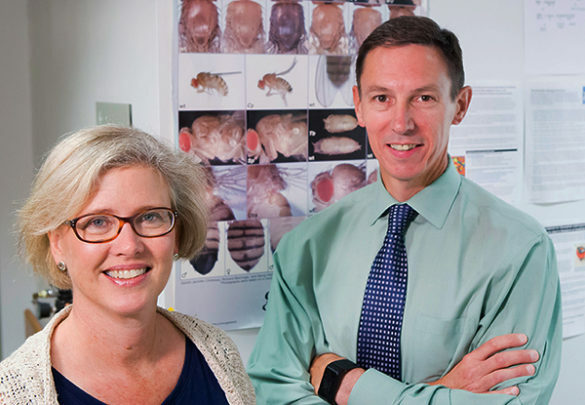 So, the researchers—headed by Professor of Physics and Biological Sciences Shane Hutson and Associate Professor of Cell and Developmental Biology Andrea Page-McCaw—targeted cells on the back of fruit fly pupae that expressed a protein that fluoresces in the presence of calcium ions. This allowed them to track changes in calcium ion concentrations in the cells around wounds in living tissue (as opposed to the cell cultures used in many previous wound response studies) and to do so with an unprecedented, millisecond precision. The team created microscopic wounds in the pupae’s epithelial layer using a laser that can be focused down to a point small enough to punch microscopic holes in individual cells (less than a millionth of a meter). The laser’s precision allowed them to create repeatable and controllable wounds. They found that even the briefest of pulses in the nanosecond to femtosecond range produced a microscopic explosion called a cavitation bubble powerful enough to damage nearby cells. 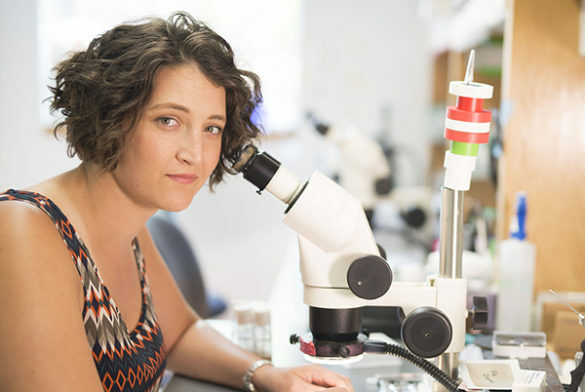 “As a result, the damage the laser pulses produce is quite similar to a puncture wound surrounded by a crush wound—blunt force trauma in forensic terms—so our observations should apply to most common wounds,” said first author Erica Shannon, a doctoral student in developmental biology. The researchers were testing two prevailing hypotheses for the wound-response trigger. One is that damaged and dying cells release proteins into the extracellular fluid which surrounding cells sense, causing them to boost their internal calcium levels. This increased calcium concentration, in turn, triggers their transformation from a static to a mobile form, allowing them to begin sealing off the wound. The second hypothesis proposes that the trigger signal spreads from cell to cell through gap junctions, specialized intercellular connections that directly link two cells at points where they touch. These are microscopic gates that allow neighboring cells to exchange ions, molecules and electrical impulses quickly and directly. Next, a short-lived, short-ranged wave spreads through healthy neighboring cells. The bigger the wound, the faster the wave spreads. The speed with which the wave moves suggests that it travels through gap junctions and is made up either of calcium ions or some other small signaling molecule. About 45 seconds after wounding a second wave appears. This wave moves much more slowly than the first wave but spreads considerably farther. The researchers interpret this to mean that it is being spread by larger molecules, most likely special signaling proteins, that diffuse more slowly than ions. However, they caution that further experiments are required to confirm this supposition. The second wave only occurs when cells are killed, not when they are just damaged, suggesting that it is dependent on the extent of the damage. The first two waves spread relatively symmetrically through the tissue. After the second wave, however, the area of high calcium concentration begins sending out “flares”—directional streams of calcium uptake that spread farther into the surrounding tissue. Each flare lasts for tens of seconds and new flares continue starting for more than 30 minutes after the injury. “Once we understand these trigger mechanisms, it should be possible to find ways to stimulate the wound healing process in people with conditions, like diabetes, that slow down the process or even to speed up normal wound healing,” said Hutson. Graduate student Aaron Stevens, research assistant Wes Edrington, undergraduate researcher Yunhua Zhao and graduate student Aroshan Jayansinge also contributed to the research, which was funded by National Institute of Health grants R21AR068933 and 5T32CA119925 and National Science Foundation grant REU 1560035.